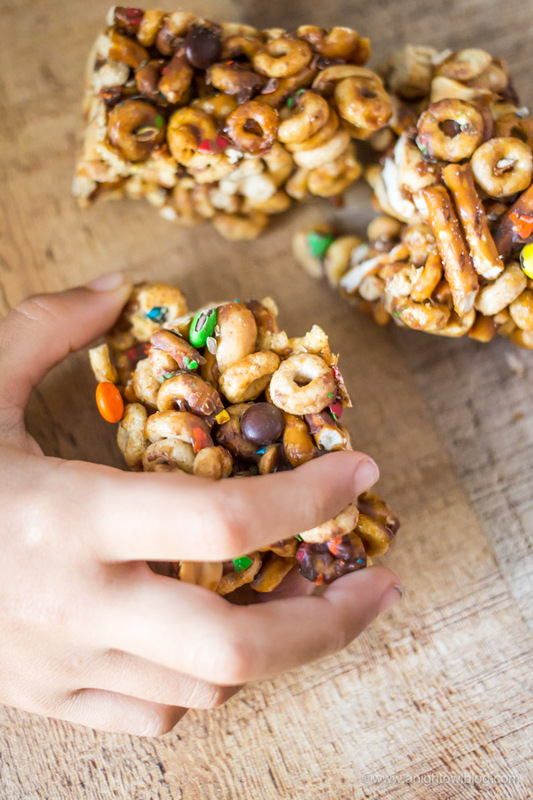 These Easy Monster Cereal Bars with Cheerios are an easy and delicious snack – perfect for those hungry after school bellies! Hi friends! 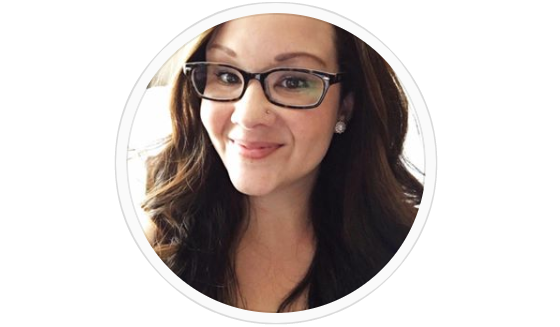 Chances are, your kids are back to school or on their way back real soon! Back to the daily routine, which for us includes feeding hungry bellies after school. No matter what I send for them during the day, you’d thing my boys hadn’t eaten anything all day when they get home. And that’s where a little creativity and Cheerios comes in! 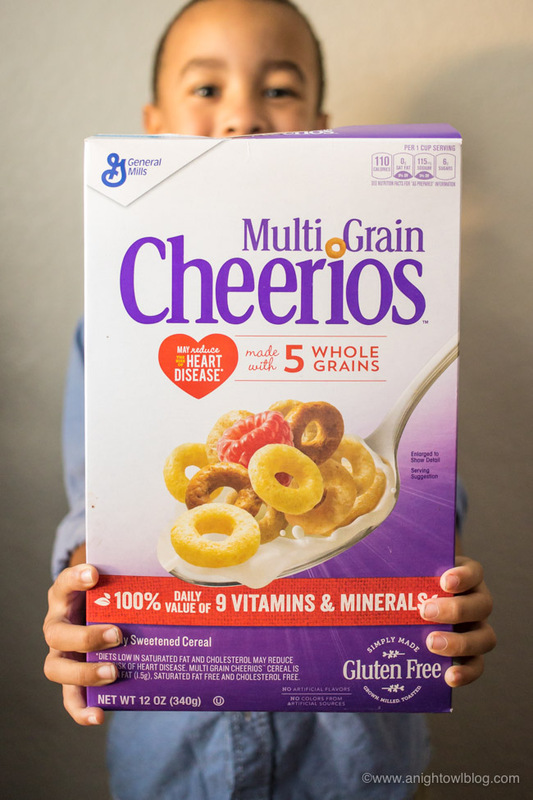 We’re real big fans of Cheerios in our home! 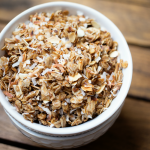 Made with 100% whole grain oats (like oatmeal! 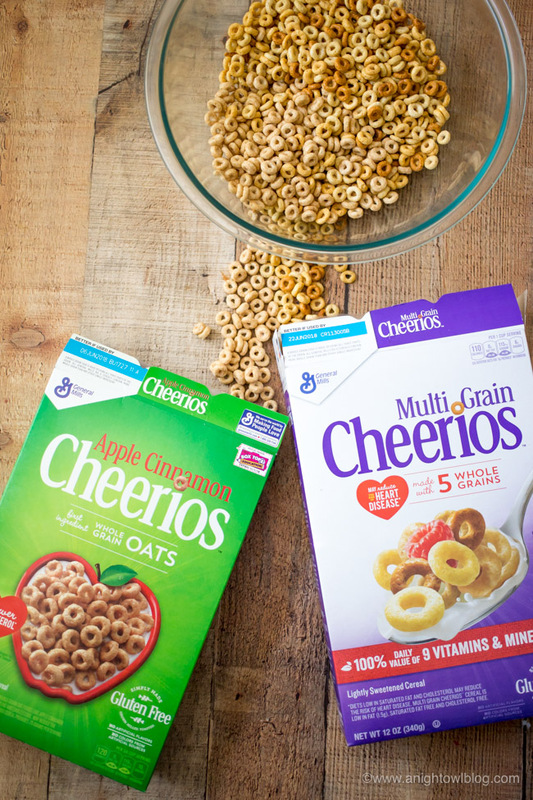 ), gluten free and zero artificial flavors and no artificial colors – you’ll be comfortable bringing Cheerios home. 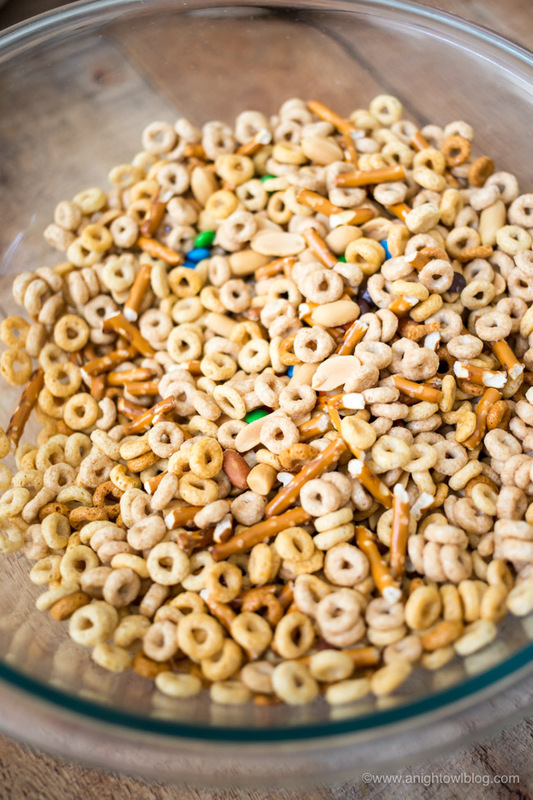 I love Honey Nut Cheerios, my older boys love Apple Cinnamon Cheerios and my almost 2-year-old loves Multi Grain Cheerios! We always have a few boxes in the pantry, so I decided to break them out to whip up some cereal bars. 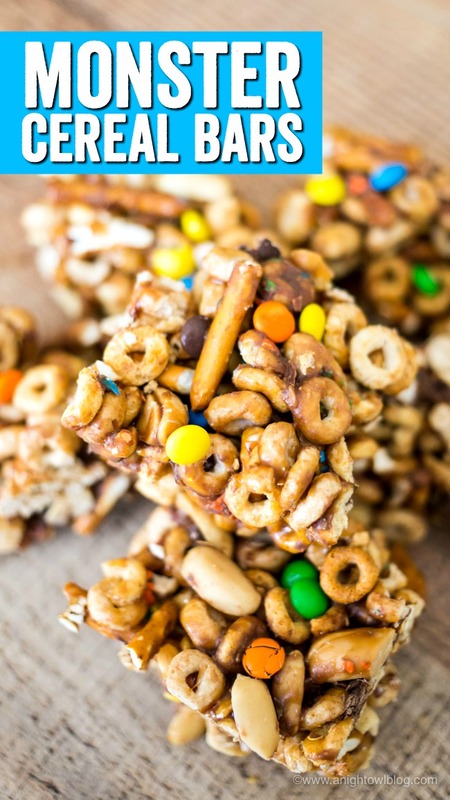 You can use what you have on hand, which makes these Easy Monster Cereal Bars so much fun! First, start with Cheerios! 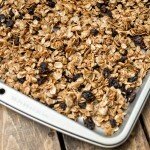 Any kind will do – we used half Apple Cinnamon and half Multi Grain. Then we added some pretzel sticks, peanuts and a few mini chocolate candies. Then just pop a bowl with a little butter, brown sugar and “sticky sugar” of choice (we used agave) in the microwave stir and let cool and pour the mixture over your the cereal mixture. Stir until covered and spoon into a greased 8×8 dish. 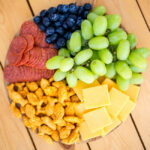 Let those cool, even pop them into the refrigerator a bit to harden before cutting. 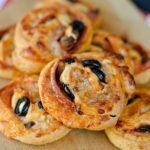 Once they’re ready, give them a good rough cut and they’re ready to be devoured! I didn’t take long for my boys to get their hands on them! And here’s the deal – they thought they were having such a treat. 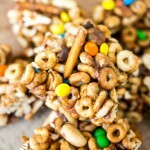 These Easy Monster Cereal Bars are fun and delicious, and snacks that you can feel good about! 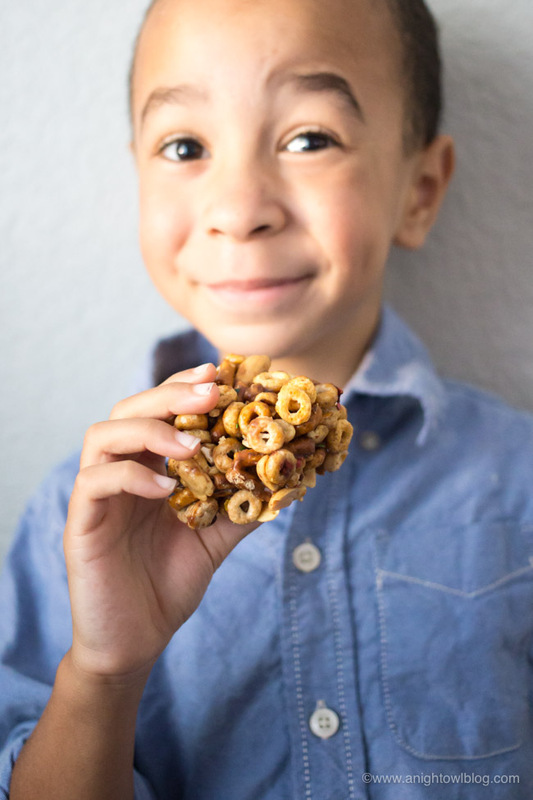 So if you’re looking for something to feed those Back to School bellies, give our Cheerios cereal bars a try! And let us know what you think! Spray sides and bottom of 8-inch square pan with cooking spray. 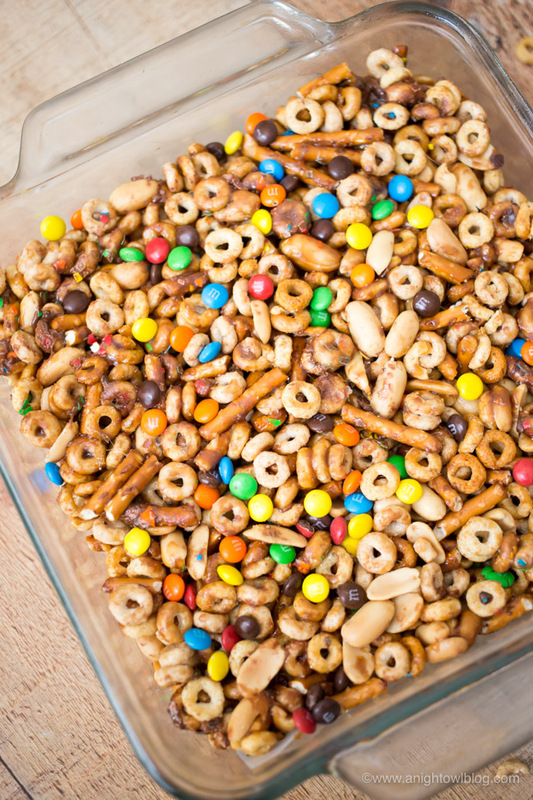 In large bowl, mix cereal, peanuts, chocolate candies and pretzels; set aside. In large microwavable bowl, microwave brown sugar, agave syrup and butter uncovered on High 2 to 3 minutes, stirring every 30 seconds, until mixture is boiling. Microwave an additional 1 minute allowing mixture to boil and thicken slightly. Let stand 3 minutes to cool slightly.